We’re experiencing our first heatwave of the farm season and it feels like we’re moving through molasses out in the fields. We’re putting in long days and the hot weather is definitely taking its toll. Luckily, we’re craving pretty simple food and the spring bounty makes meal time (or happy hour snacks) really easy. 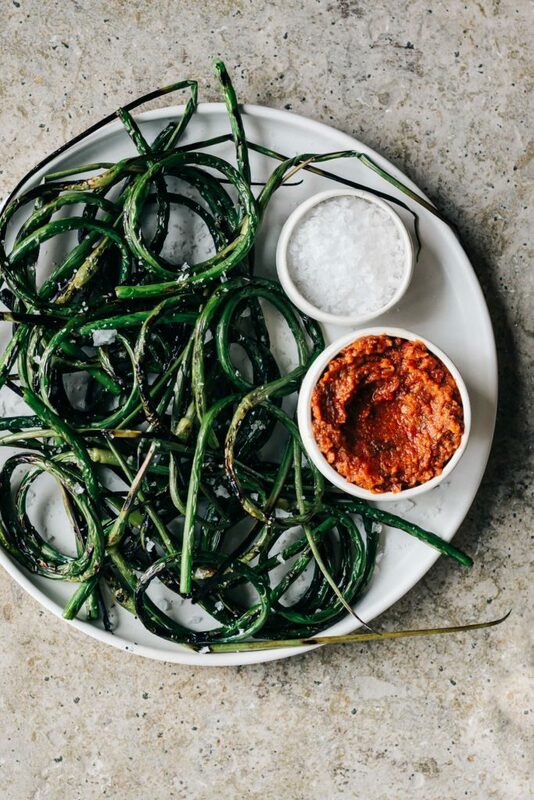 These grilled garlic scapes with sun dried tomato pesto and sea salt are our absolute favorite appetizer at the moment. Garlic scape season doesn’t last long and we’re trying to enjoy these seasonal gems as much as we can. This simple method of lightly charring them on the grill and dipping them into a flavorful sun dried tomato pesto is by far our favorite way to prepare them. We used up the last of our sun dried tomatoes that we canned last summer and they were wonderful whipped into a simple pesto with these crispy scapes. This appetizer can be prepared in a flash and tastes best when enjoyed outside with good friends and a few cold beers. Blend the sun dried tomatoes, garlic, basil, pine nuts and a pinch of salt in a food processor and pulse until a paste forms. With the motor running slowly add the oil. Process until smooth, adding a touch more olive oil if necessary. Taste test and adjust seasonings as needed. Preheat an outdoor grill to medium. Toss the garlic scapes with the oil until evenly coated. Place the scapes in a single layer on the grill (you may need to do this in batches) and grill until lightly charred on both sides, about 2-3 minutes per side. Place scapes on a platter and sprinkle with flakey sea salt and serve with the pesto. I am growing garlic for the first time, and it is so much fun to snap off a scape. This looks like a lovely use for them–it reminds me of the Spanish calcot onions dipped in romesco sauce. I’ve never eaten or have seen garlic scapes. Are they similar to asparagus stalks in texture? loving the looks of this plate – i, too, have never eaten or seen garlic scapes – sounds really good! !